I remember a biology lesson at school when I was about 13. We had to take a sunflower head apart and examine the different parts. We learned about these exquisite little disc florets that make up the centre of the flower. 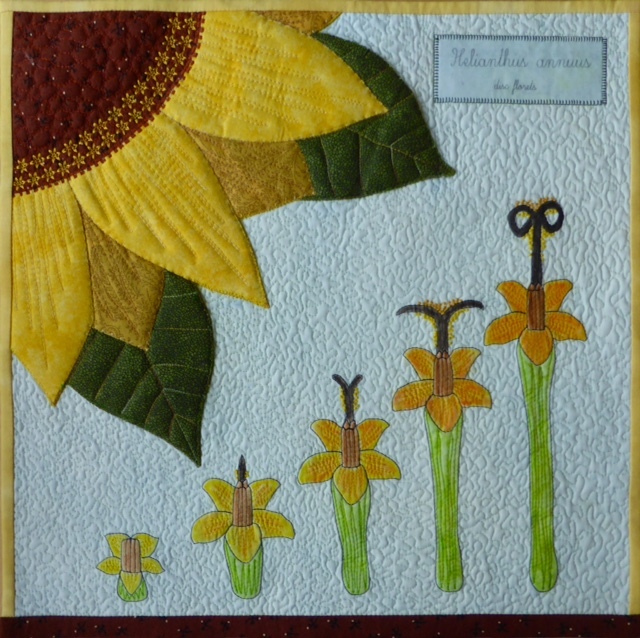 My quilt shows 5 stages in the development of a disc floret. The French knots represent pollen grains – yellow from the same floret, orange from a different one. After these 5 stages each fertilised floret would go on to produce a seed. The quilt is made entirely from cotton. The large flower section was appliqued then I drew the florets and coloured them with Inktense pencils. I added detail with hand and machine embroidery. Smiling at your sunflower, Helen. They are great favourites out here, and I’ve a neighbour who grows several different varieties. I also feed their seeds to the birds here in winter. I was thus intrigued by your detailed drawings as I’ve never looked at a sunflower that closely. Such an elegant amd informative piece. I love the way how you just placed,part of the flower in full bloom in the left corner. Beautiful quilting too. Very nice Helen, I like how you describe the different stages of the florets. And as usual your stiches are beautiful. Another superb piece Helen. I grew three varieties of sunflowers in our garden last year and they were very popular with the birds. 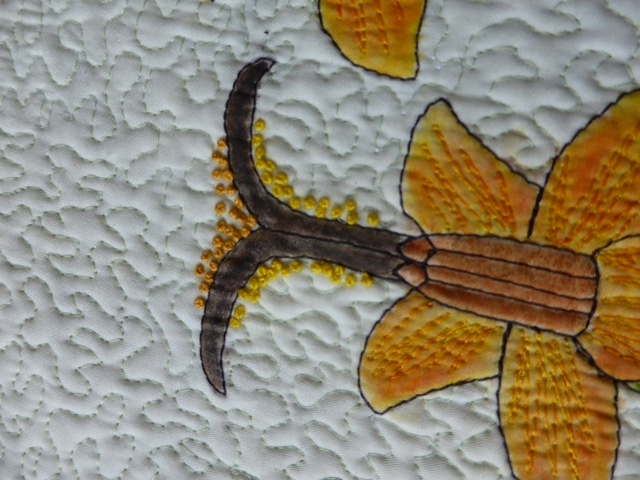 Your design work, the stages of the florets, and the fine stitching and quilting just add to the overall effect of the quilt. A great interpretation and the attention to detail is brilliant, would love to see a close up of the main flower…. I to grow sunflowers every year just love the colours available now. I like how you interpreted the growth of the florets. Sunflowers, always so nice to look at, but I never noticed the way they grow like you describe and show in your piece. Very well done and a nice and stylish way to show the process. Thank you for sharing this information, and my compliments on all the techniques you used. I also like how you did the different stages. I also like you did just a part of the flower in the corner. And again perfect stitching! A very cheerful piece. The large sunflower caught my attention first. I had no idea how they grew, and seeing your rendition of the germination process is educational. Your hand embroidery and the quilting are lovely, and it is interesting to see Inktense pencils in action. I love the embroidery. I also love the depiction of how the flower grows and matures.